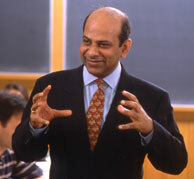 Vijay Govindarajan - Why Can’t U.S. Health Care Costs Be Cut in Half? Technological improvements in health care have given us the quality of life we enjoy today. But chronic conditions, end-of-life care, and an aging society will bankrupt the United States if it doesn’t make dramatic changes to its health care system. America — and many other countries — need an audacious goal to get off the unsustainable path. What if the United States set itself the goal of cutting healthcare costs in half — without sacrificing quality, and in about a decade?